While stocking up with supplies before hurricane Frances rolls through, we spotted Target selling Reese’s 1 carb peanut butter cups and decided to grab a few. This product does not seem to be a part of Hershey’s “Carb Alternatives” line. The website set up for Hershey’s 1g limits itself to the 1 carbohydrate Hershey bars that were introduced last year. 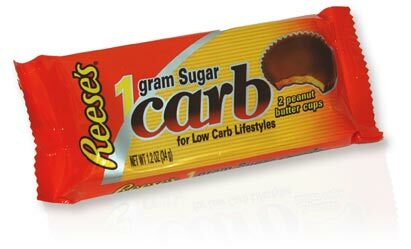 It doesn’t really matter if they are new or not though–it’s low-carb candy. A total of 8 candy loving reviewers sampled the Reese’s Cups. All claimed to be fans of the original high carb version, which frankly is not hard to believe (they are so good). While the response wasn’t amazing, no cup went uneaten. In fact, we had to go back to get a pack for the photo shoot. Read on for our take. While not as good as regular Reese’s Cups, they are better than no Reese’s Cups at all. If you have a hankering for sweets, this may do the trick. Peanuts, erythritol, cellulose gel, chocolate, inulin (fiber), cocoa butter, polyglycitol syrup, cream (milk), contains 2% or less of: salt, soy lecithin and PGPR, emulsifiers, glycerin, sucralose, vanillin, artificial flavors, TBHQ (preservative) and acesulfame potassium.